Chuhak & Tecson, P.C., is proud to announce that attorney Leynee A. Cruz has been named to the Latinos 40 Under 40 list, a highly selective honor given to Latinos in the Chicago area by Negocios Now, a national award-winning publication. For the fourth consecutive year, Negocios Now has recognized 40 talented Latinos after a six-month nomination period, representing business, government, nonprofits, politics, sports and education, among other fields. Cruz concentrates her legal practice in all aspects of probate and guardianship administration and litigation. She is often appointed as Guardian Ad Litem by Cook County Probate Division judges to assist in matters relating to adult and minor guardianship. She provides representation in trust and estate administration matters, from the initiation of proceedings to the discharge of personal representatives. Before moving to Chicago in 2014, Cruz practiced law in South Florida where she worked alongside Cuban attorneys based in Havana, Cuba, representing Cuban national beneficiaries. Her experiences in Cuba were the most challenging in her career and communicating legal principles to her clients without access to the internet or a fax machine and sending telegrams instead of having phone conversations were obstacles that she quickly adapted to. This experience also helped her further appreciate the sacrifices her grandfather, a Cuban political prisoner, made by fleeing to the United States leaving everything he ever knew and loved behind. Cruz believed she would become a social worker but when she began working as a legal secretary during her college years for the Guardianship Program of Dade County, Inc., it sparked her decision to attend law school. Leynee received her J.D and Certificate in Elder Law from St. Thomas University School of Law in Florida. Prior to receiving her degree she founded and served as president of the Elder Law Society, which was recognized in 2013 as the Student Bar Association’s Organization of the Year. After Cruz’s move from Miami to Chicago, she volunteered at the Center for Disability & Elder Law in Chicago where she advised, drafted and executed estate planning documents for low-income elderly and disabled clients. She is currently a member of the Young Professionals Board for the Center for Disability & Elder Law. 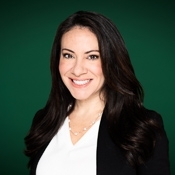 In addition, Cruz currently serves as president-elect of the Hispanic Lawyers Association of Illinois and will take the helm of president in June 2019. For the Hispanic Lawyers Scholarship Fund of Illinois, she is one of the board of trustees. She is a member of the Chicago Bar Association, Illinois State Bar Association and Women’s Bar Association. Cruz was recently selected as a Rising Star by Super Lawyers Magazine, an honor earned by only 2.5 percent of Illinois attorneys. Nicado Publishing Company, owner of Negocios Now, was launched in 2007 with a strong focus on Hispanic niche markets. Today Negocios Now is the most awarded Latino business publication in the US. The company produces custom media and content through Hispanic News Agency (HiNA at www.hinaonline.com).